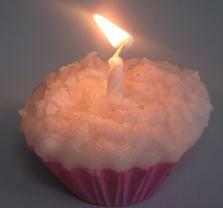 A cupcake candle is easy to make and you can be as elaborate with your decorating as you want. It is a fun activity and you can involve your children with the painting, or be a spoil-sport and do it all yourself. You can either add dye to the melted wax or you can paint the cupcakes to achieve the "look" you are after. You can even add chopped crayon bits to resemble nuts and decorations. 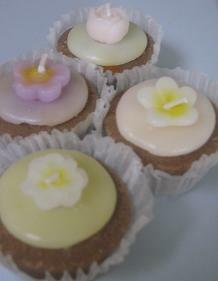 I will show you how to make cup cake candles in a few easy steps. 1. Place 2-3 baking papers into each other for strength and then place them into cupcake tray to hold their shape. 2. Melt Wax, add colouring dyes if you wish to colour the wax. 3. Pour melted wax into the prepared moulds and fill to almost the top of the baking papers. Allow to cool and set. When it is nearly set, place birthday candle in and hold upright for a few seconds. 4. Meanwhile, prepare the 'frosting'. Melt wax and add dye to achieve desired colour. 5. Cool the melted wax till you see a thin skin forming on it. Whip it with a whisk till it gets frothy. Quickly, spoon the froth over the cupcake. If the wax solidifies before you are able to spoon enough froth, repeat the melting, cooling and whipping process. 6. While the frosting is still warm, sprinkle on pieces of crushed crayons if desired. Adding dyes to the melted wax is the easier option when it comes to decorating your cupcakes. Painting with acrylic paints can be much more fun. You can paint and decorate to your heart's content. If you love cupcake candles but can't be bothered making them yourself they are readily available for purchase. I bought the four (pictured above) from an on-line store. They are scented and smell beautiful when lit. If you want to try making your own candles, here are some cupcake molds which are suitable for making candles, soap and bath bombs.